Lyme disease is an infection caused by spirochete bacteria — Borrelia burgdorferi — that is transmitted to people and animals through the bite of an infected deer tick, known as a black-legged tick. According to the Centers for Disease Control and Prevention (CDC), Lyme disease is the most common arthropod-borne illness in the U.S. According to the CDC, an estimated 329,000 people are diagnosed with Lyme disease each year in the United States. The CDC also states that age, gender, and outdoor exposure are risk factors in who gets Lyme disease. The condition is most common in boys under 15, and men between 40 and 60 — groups that are more likely to play outside and engage in outdoor activities. Deer ticks that pose a risk for Lyme disease are primarily located in the Northeast and upper Midwest areas of the United States. The CDC has found that around 95 percent of cases occur in 14 states, including Connecticut, Delaware, Maine, Maryland, Massachusetts, Minnesota, New Hampshire, New Jersey, New York, Pennsylvania, Rhode Island, Vermont, Virginia, and Wisconsin. The most distinctive Lyme disease symptom, however, is a skin rash called erythema migrans. This rash usually has a characteristic bulls-eye appearance around the location of the tick bite. 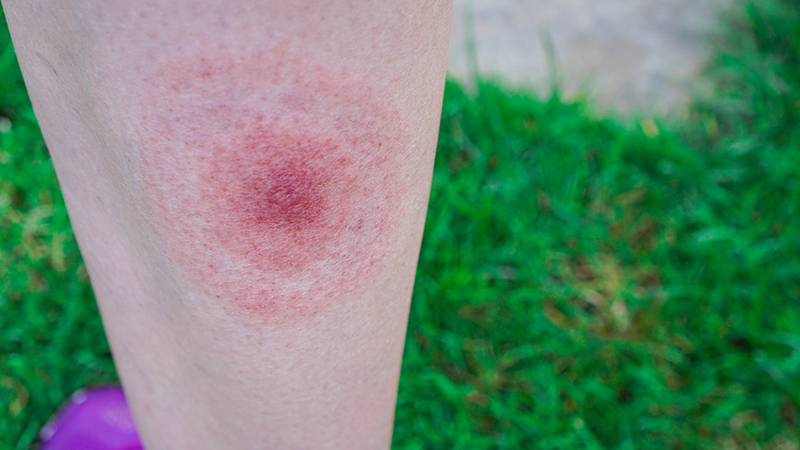 The erythema migrans rash is estimated to occur in up to 80 percent of Lyme disease infections and can start as early as three days after the bite, or as late as 30 days, but typically shows up within a week. The rash is usually around six inches wide but can be up to 12 inches in width or more. It appears anywhere on the body, and usually lasts from three to five weeks. On darker skin, the rash may look more like a bruise. Step 1: The “EIA” (enzyme immunoassay) test or, less commonly, the Immunofluorescence Assay (IFA) is performed. Step 2: If the EIA or IFA is positive, or inconclusive, the second test performed is an immunoblot test, also known as a “Western blot” test. If the symptoms are new-onset (less than 30 days), the IgM Western Blot is performed. If symptoms have been present for more than 30 days, a positive or inconclusive EIA or IFA test is followed by the IgG Western Blot test. Two key antibiotics — amoxicillin and tetracycline — are used to treat Lyme disease. Typically, a 10-day to a 21-day course is prescribed. In some cases, the antibiotics cefuroxime or doxycycline are used. In longer-standing cases of Lyme disease, intravenous (IV) antibiotics are sometimes used, in some cases for a longer period. According to National Institutes of Health (NIH) research, most people recover from Lyme disease after a course of antibiotics. In some cases, Lyme disease symptoms such as fatigue, muscle aches, and cognitive issues persist for more than six months. This is called “post-treatment Lyme disease syndrome” (PTLDS), or post Lyme disease syndrome (PLDS). It is also sometimes referred to as “persistent Lyme disease” or “chronic Lyme disease.” Researchers estimate that around 10 to 20 percent of patients have PTLDS, with continuing joint inflammation and other Lyme symptoms for months or years after treatment. Some experts recommend long-term use of antibiotics — including IV antibiotic therapy — to help resolve PTLDS. Maryland/Washington, D.C.-based naturopathic physician Kevin Passero, N.D., works with many PTLDS patients in his practice, Green Healing Wellness. He recommends working with a knowledgeable naturopath or physician trained in nutritional medicine, to evaluate supplements that can complement medical treatment of persistent Lyme disease symptoms. Among the supplements that Dr. Passero often recommends to PTLDS patients are alpha lipoic acid for nerve support and nerve pain, cat’s claw for joint pain and inflammation, colostrum to help the immune system and gut, and turmeric for inflammation. Why some people develop PTLDS is not known, but it’s thought that antibiotic-resistance and an autoimmune reaction plays a role. Some experts theorize that an autoimmune response is triggered by the Lyme disease infection, causing increased levels of antibodies that attack the joints. Some research has also shown that in the presence of a genetic predisposition to autoimmunity, Lyme disease may give rise to a number of autoimmune diseases that attack other tissues, organs, or glands, including Hashimoto’s thyroiditis. Holtorf Medical Group founder, Kent Holtorf, M.D., is clear in his advice: “If you have been diagnosed with hypothyroidism, but are not seemingly responding to thyroid hormone replacement treatment, familiarize yourself with the signs and symptoms of Lyme disease.” Dr. Holtorf recommends that if you suspect Lyme disease, you should consult with a physician who has expertise in diagnosing and treating Lyme and PTLDS. New treatments are also being explored for Lyme disease and PTLDS, especially when concurrent with autoimmune thyroid disease. As part of his advocacy for Lyme disease patients, Dr. Holtorf has called attention to cutting-edge research into disulfiram (Antabuse), a drug usually used to treat people with alcohol abuse problems. Disulfiram is showing promise as a possible PTLDS treatment, and more research is underway. What Precautions Are You Taking Against Lyme Disease?